Human heart is four chambered with two atria and two ventricles. The atria have reservoir function, receiving blood from major blood vessels. Their wall is thinner than the ventricles. When ventricles themselves are compared for their thickness, we can observe that the right ventricular wall is thinner, than the left ventricle. That’s why the pressure developed from right ventricle is less, which is sufficient for ensuring pulmonary circulation. The pressure developed in the right ventricle in systolic phase is 25 mmHg and during diastole, the pressure decreases to 10 mmHg. The left ventricular contraction gives rise to systemic circulation and hence the pressure developed here is greater. The peak pressure during systole is 120 mmHg and during diastole the pressure falls to 80 mmHg. 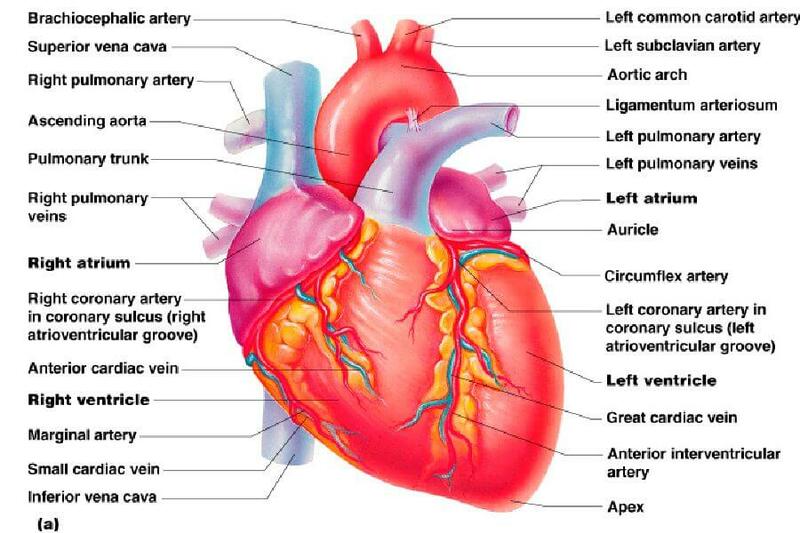 To regulate the flow of blood within the chambers of the heart and between the chambers of the heart and major blood vessels, there are valves present. Atrio ventricular valves are present between atria and ventricles. Tricuspid valve is present between right atrium and right ventricle and between left atrium and left ventricle, bicuspid or mitral valve is present. Semilunar valves are present to regulate the flow of blood between ventricles and the major blood vessels. The aortic valve is situated between the left ventricle and aorta, while the pulmonary valve is present between the right ventricle and pulmonary artery. The valve function is to regulate the flow of blood in one direction only. That is, when they close, backward flow is prevented. pericardium, which contains a thin serous fluid. It acts as a lubricant for the mechanical activity of the heart.